In the homiletics field, a text has been needed that blends hermeneutics, sermon development, and sermon delivery. 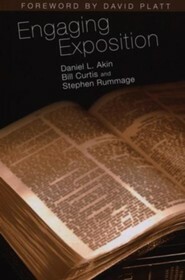 Engaging Exposition fills that gap with what its experienced authors call a "3-D approach" to preaching. Bill Curtis writes about the Discovery process—how to equip the student to discover the meaning of a biblical text by using sound principles of interpretation, and to move from biblical analysis to biblical interpretation. 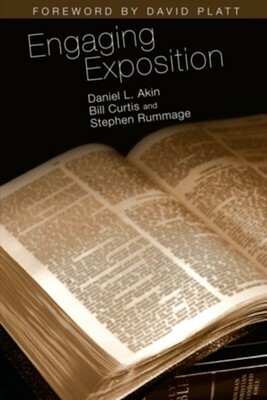 Danny Akin addresses the Development process—how to equip the student to develop expository sermons based upon results of the interpretive process, and to move from the Main Idea of the Text (MIT) to the completed sermon. Stephen Rummage explains the Delivery process—how to equip students to deliver expository messages using the completed sermon, and to move from an understanding of speech communication principles to persuasive delivery. David Platt is pastor of the Church at Brook Hills in Birmingham, Alabama. He holds a Ph.D. from New Orleans Baptist Theological Seminary and is the author of the best-selling book, Radical: Taking Back Your Faith from the American Dream. I'm the author/artist and I want to review Engaging Exposition - eBook.